Why Can’t Progressives Get Traction? As we go into the next election cycle, many on the Left who were enthusiastic about the advent of President Obama and a new political time are now disenchanted and reluctant to re-engage in the mainstream political process. 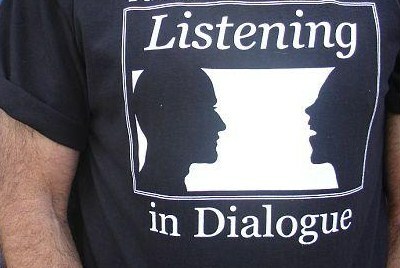 An article from Peace Developments in 1998 suggests that the preliminary lessons from the Peace Development Fund’s Listening Project remain unlearned. The United States has not seen a progressive social change movement strong enough to gain substantial victories since the ‘60s. At time sit is hard not to think that we are losing ground as economic inequality becomes more marked and attacks on immigrants, poor people, and organized labor increase. While the progressive movement won critical victories in the ‘60s and ‘70s, the backlash from those successes resulted in the regalvanization of the Right. The progressive movement became ideologically fractured, and in the absence of a uniting vision, the Right was able to win popular opinion about a series of narrowly focused, reactionary ideas based on its own self-interest. As we grow closer to the millennium, PDF is increasingly concerned about the Left’s ability to build real and lasting progressive change. PDF believes that there are several barriers that inhibit progressive work from achieving greater impact. To name just a couple of those barriers, too many organizations are working in isolation, disconnected from each other and from larger national issues and information, while many of the Left’s victories have been local, leaving a serious need for more regional and national successes. It is in this context that PDF believes it is time to be asking harder questions of ourselves. How can we create consequential change on a national level? How can we make the transition from localized and disconnected work to a strong, broad-based, progressive movement that has the power to transform the national landscape? Out of the desire to answer these questions – to make sure PDF’s efforts are targeted most effectively to create lasting change – arose the Listening Project. 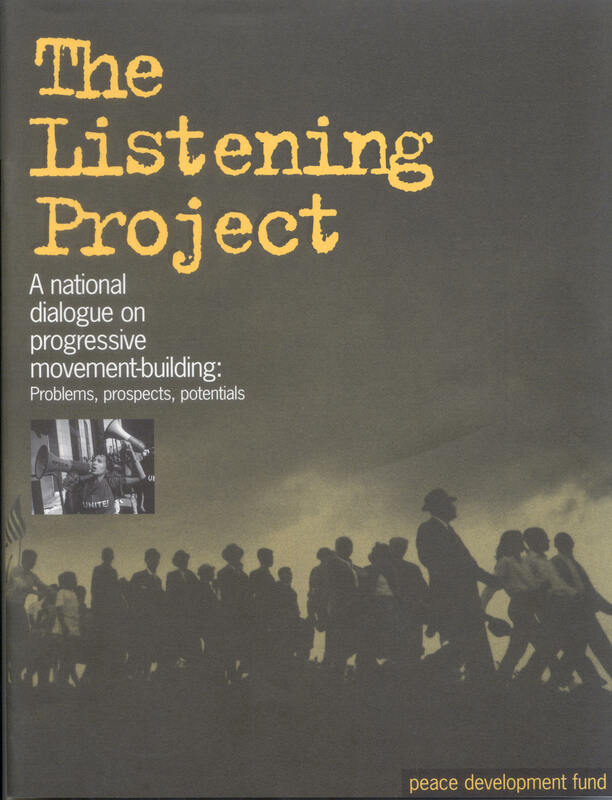 The Listening Project was designed specifically to hear from social change organizers and activists, across a spectrum of sectors and from around the country, to gather thoughts on movement-building in today’s political and social milieu. People’s responses have been intriguing and informative, and have also raised additional, critical questions. What Is a Social Change Movement? Listening Project participants are being asked, “What does the term ‘social change movement’ mean to you?” There are some widespread commonalities as well as interesting differences in how people are thinking about social change movements. A common vision seems to be the most necessary characteristic according to respondents, without which people are not connected. The great majority of interviewees feel that, for the most part, progressive work remains disconnected, lacking a shared analysis, consciousness, or vision. In the “Undoing Racism” training of the People’s Institute for Survival and Beyond participants are asked to define racism. As their ideas and thoughts are written down, it is clear that people have extremely diverse ways of thinking about racism. Such a varied analysis has colossal implications for undoing or dismantling racism. How can people and organizations that have widely different views about racism work together to dismantle it? Language is very important for developing a shared understanding of issues, and many people have suggested that much more effort must go into creating a common framework for understanding such issues as poverty, racism, and class before we can work together in a meaningful way. 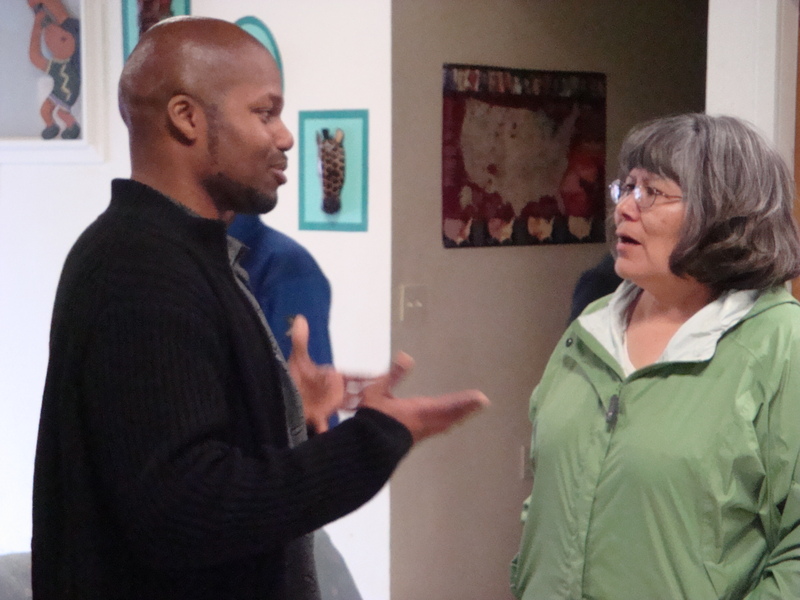 Many interviewees mentioned the need for simultaneous, multiple approaches to progressive social change work. Despite the acknowledgement of the need for diverse roles and strategies in movement-building, there was an overall belief that the various sectors are not interested in connection to one another. This is definitely a point of tension, and a perceived weakness among the Left. Many people are working with the opinion that their strategy is the most effective path toward change, without understanding the synergistic role of the various progressive sectors. For example, without grassroots organizing, there will be no base of people to push progressive policies through, yet there are few policy organizations that outreach to and receive input from the grass roots. Perhaps one of the most talked about barriers to building a broad-based movement is the challenge of articulating our message. A large majority of interviewees in the Listening Project are talking about our lack of influen ce with the media. Our work, very simply, is not being reported. This is a devastating problem resulting in serious public misconceptions about truth and reality and an under-representation of the successful progressive work that is happening. People advocated the need for more media savvy and an increase in alternative media projects. The second aspect of the challenge of articulating our message lies in how we craft our communications and our campaigns to resonate with people and to create links across difference. What are the issues that lend themselves to coalition-building and connecting diverse constituencies? Can we organize around those issues? Some of the issues that have the potential to build bridges are living-wage campaigns, environmental justice, education, and defeating the anti-democratic Right. Wedge issues pose a serious challenge to the goal of building a broad-based movement. There are huge numbers of organizations that stay away form critical issues in fear of losing membership. Many interviewees expressed the need for help in dealing with high levels of homophobia among their membership. Along the Bible Belt, for example, although organizations may successfully organize around economic justice issues, they avoid working on a gay rights case lest their membership dwindle. In order to address wedge issues and keep them from splitting us apart, many interviewees emphasized the need for extensive education around cultural and oppression issues: This is the pre-work that must be done before a broad –based movement can truly coalesce, they said. Geographic isolation increases the challenges presented by the lack of a common language or analysis and the efforts to connect oppressions. PDF’s Exchange Project all too often sees groups attending regional workshops, realizing for the first time how many communities face struggles similar to their own. In the Northeast, where the population is highly concentrated and consists predominantly of urban and suburban communities, isolation is not a problem. But the Southeast, Southwest, Midwest, and Northwest have predominantly rural communities. In these regions, groups need more resources and more opportunities to come together. Surprisingly high numbers of interviewees mentioned factionalism, ego, and turf issues as major barriers keeping progressive work from coming together. When individuals or organizations are more interested in their individual successes than in the greater good, movement-building can be extremely difficult. Unfortunately, these are barriers for which interviewees have no, so far, offered solutions. As we bring the Listening Project to a close later this spring, we look forward to sharing what we are hearing and learning. In publishing and distributing the findings for the Listening Project, it will be a tool for individuals and organizations interested in movement-building. It will be an examination of the trends in how people think about progressive movement-building, and the implications of those trends. We hope it will spark further dialogue and planning, encouraging others to look at their own work. Comments : Comments Off on Why Can’t Progressives Get Traction?